Facebook is a social networking site which enables people to connect with friends and people around. But one thing which seems very old and boring is the annoying blue theme of Facebook. Today I will share my first trick about how to change that old theme to put your customize theme. The final outcome will look something like this. Requirement: The basic requirement for this is to have Google Chrome or Mozilla Firefox as your Browser. Note: At the time of my testing , I got this theme from second page. 1. Install Stylish extension for chrome from chrome web store . After that a S icon will appear at the right of address bar. 2. Now go to Facebook.com and click on the S button. 3. Click on “Find Styles for this Site” to open a new tab with free themes to use for Facebook. 4. Now click on any theme and a preview will be open for you. 5. If everything goes as per plan in the previewed theme, then at right corner of the screen Click on “Install with Stylish” button. 6. 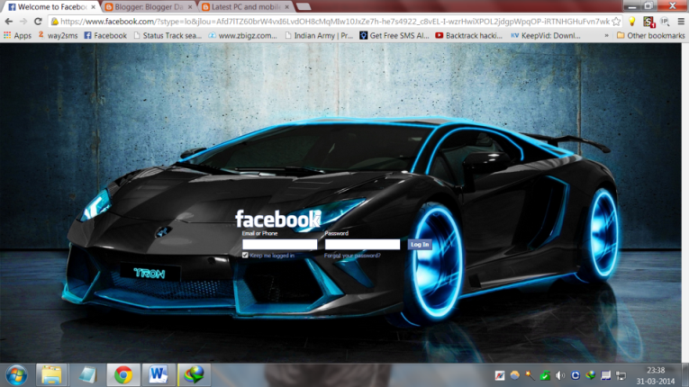 Now log out and try to open Facebook.com. You will see the customized log in screen of your own choice. 1. Open Mozilla Firefox and install “Stylish” add on. 2. Restart Firefox after successfully installing the Stylish add-on. 3. Open Facebook.com and click on small S button at right side of address bar. 4. Click on the desired theme and you will see the preview. 6. A dialog box will appear ,click on install. You can also change the color of Google,you tube like sites with Stylish. I have not tested in other browser except these two.. so please let me know if this works on other browsers.